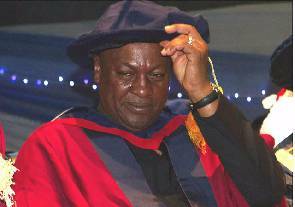 UK-based University of Aberdeen will on Friday hold a special convocation to confer an honorary degree of Doctors of Laws (LLD) on President John Mahama. 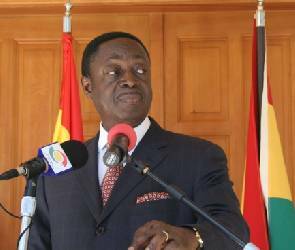 The convocation, according to a statement issued by the Flagstaff House Communications Bureau, will take place at the University’s Kings College. The honorary award will form part of the President’s working visit to Scotland, the statement said. President Mahama left Accra Wednesday for Glasgow to meet with the First Minister of Scotland and visit the Scottish Parliament where he will observe First Minister’s Question Time and address a meeting of Parliamentarians. The President is accompanied, by the First Lady, Lordina Dramani Mahama, Foreign Minister Hanna S. Tetteh (MP), Communications Minister Dr. Edward Omane Boamah and the Education Minister, Professor Naana Jane Opoku Agyeman. Mahama and his entourage are also expected meet leaders of Scotland’s political parties. With this visit, President Mahama becomes the second Ghanaian President to visit Scotland after President Jerry John Rawlings. The visit provides an opportunity for the two countries to strengthen political and economic relations, the statement said. President Mahama will also interact with the Ghanaian community and address a Business Forum. With the Vice President on an official visit to India, the Speaker of Parliament Mr Edward Doe Adjaho has been sworn in as President, in accordance with Article 60 (11) of the 1992 Constitution.